"Allah warns us not to get close to adultery because it's the wrong way," another man says as the shooter gets closer to the woman. "It is the order of Allah that she be executed". Provincial Governor Basir Salangi said the video, obtained on Saturday, was shot a week ago in the village of Qimchok in Shinwari district, about an hour's drive from Kabul. Such rare public punishment was a painful reminder to Afghan authorities of the Taliban's 1996-2001 period in power, and it raised concern about the treatment of Afghan women 11 years into the NATO-led war against Taliban insurgents. "When I saw this video, I closed my eyes ... 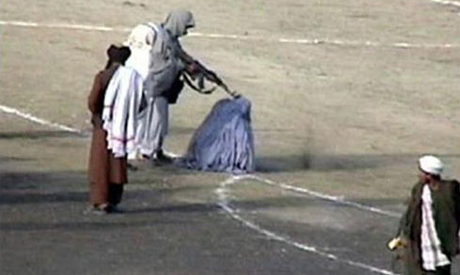 The woman was not guilty; the Taliban are guilty," Salangi told Reuters. When the unnamed woman, most of her body tightly wrapped in a shawl, fell sideways after being shot several times in the head, the spectators chanted: "Long live the Afghan mujahideen! (Islamist fighters)", a name the Taliban use for themselves. HARD-WON WOMEN'S RIGHTS IN JEOPARDY? Violence against women has increased sharply in the past year, according to Afghanistan's independent human rights commission. Activists say there is waning interest in women's rights on the part of President Hamid Karzai's government. "After 10 years (of foreign intervention), and only a few kilometres from Kabul... how could this happen in front of all these people?" female lawmaker Fawzia Koofi said of the public execution in Parwan. "This is happening under a government that claims to have made so much progress in women's rights, claims to have changed women's lives, and this is unacceptable. It is a huge step backwards," said Koofi, a campaigner for girls' education who wants to run in the 2014 presidential election. I am filled with disgust at seeing such an atrocity...where is their humanity...they are arrogant DOGS....who fear woman...Living breathing, Psychopathic Dogs....Cowards with No conscience...and It could happen here too...we have allowed These kind of folks to immigrate here....beware some day our Nation may also be a 3rd world Country Run by these Cowards!....very Scary! Why bring in the Talibans into Egypt now? The video maybe true. It may not be. Like the case of the Suez murder of the Undergraduate walking with his fiancee. It wasn't done by Islamist elements, so say the Egyptian Police. Is this NOT another scaremongering exercise ORGANIZED to get Egyptians to loose confidence in their new President and The embattled Parliament? Freedom of expressions have its limits too. It is not absolute. All humans live in diferent times. People in this world are living in cultures that have changes for centuries. Humans who live in today's world of knowledge and standards cannot understand that others are living like their ancestors - many years ago. Those that cling to the past cannot understand today's world. As we go forward, this gap will get wider and barriers will need to be build to prevent mixing time zones. It is unfortunate , it has to be said , there is no real right and wrong in Afganistan . As people from previos generations have stated , nothing will change . As things are leading , it could end up the same here . In this world of computer age, it is no longer new to see this kind of video. It is a fabricated one. Even if this video is real for the sake of argument, then it is the handiwork of enemies of Islam to create hatred against Islam & Muslims. If they are actually Taliban, they will have stoned the the woman to death according to Islamic Doctrine instead of gunning her down. What is the difference if the Taliban shot her or stone her. You just said "they will have stoned the woman to death according to Islamic Doctrine" It doesn't matter how she was murdered. The point here is that they killed her! You just said it is "Islamic Doctrine" that the person must be killed for adultry. Your religion is a religion of the devil. Just the fact that it is the belief of Muslims to kill someone for adultry is evil. If someone has sinned why is it up to the public to decide what her punishiment should be? This is nothing to do with Islam. This is about the Taliban and their twisted interpretation of Islam. cast the first stone. "Oh, that's right, I forgot. Taliban apparantly seem to 'know the truth beyond all truth'. No contradictions here with these, uh, Holy...what's the word I'm looking for?...MORONS! And that, is just scratching the surface.